2 Should You Choose Danze For Your Kitchen? Danze is a highly recognizable manufacturer that sells faucets all over the world. Their products are not cheap, but they incorporate the latest technologies to provide a good user experience. But did you know that Danze faucets are some of the most durable models available on the market? The company relies on solid metal constructions and high-quality cartridges and valves to produce faucets you can use for years on end without damaging them. In the following article, we reveal the main characteristics of this manufacturer’s products. 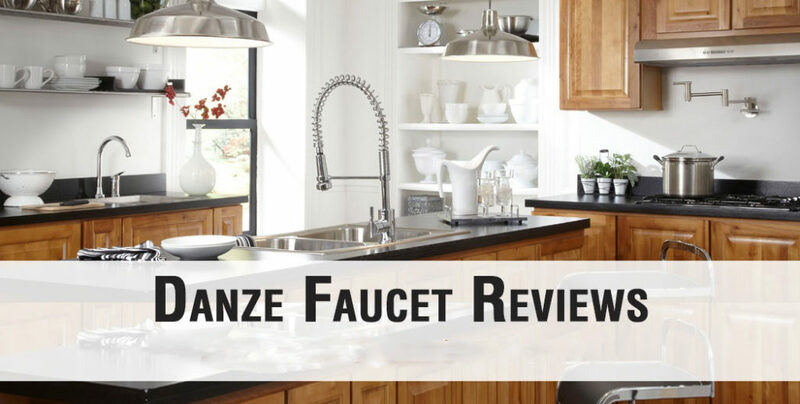 Later on, we present a short selection of Danze faucet reviews, so you can judge for yourself if their products are worthy of your kitchen or not. If you want to find out more about Danze and their products, read the article below. Size : 10.75 x 12.00 x 9.00"
If you’re looking for a high-quality pot filler that won’t take up too much space, the Danze Parma is the perfect model for you. This pot filler has two articulated pieces that can fold out of the way when you don’t want to use it. This makes the pot filler a good choice for crowded kitchens where free space is a problem, and you can even choose to install the pot filler right above the stove so you won’t have to carry it anymore. When it’s fully extended, the spout extends up to 22-inches, giving you plenty of space under the filler to place small or large pots. Articulated Pieces – The filler’s articulated pieces can fold and unfold when you need them to. This feature allows the filler to take up a small space in your kitchen. Conclusion: The Danze D205058SS is a great wall-mounted pot filler. The filler will help you in the kitchen, and its ingenious design won’t take up much space. When you’re looking for a new faucet for your kitchen, or if you’re constructing a new kitchen from scratch, it’s good to look for fixtures and appliances that are not only durable but also have a design that will be fashionable for a long time. The Danze Parma D151558SS is a modern-looking faucet with a sleek design that will look great in most kitchens. The faucet is simple, yet has a sophisticated look. With a single handle operation, this faucet is easy to use, and it’s also easy to install. Great Design – The faucet’s design is beautiful, and it will enhance your kitchen’s aspect. The cylindrical elements in the faucet’s design will make it stand out in any decor. Easy To Install – This model is easy to install, and most people won’t encounter any problems during the installation. Deck plate Not Included – The faucet is suitable for a single-hole installation, but it does not come with a deck plate. You will have to buy one separately. Conclusion: The Danze D151558SS is a great faucet that will look nice in most modern decors. The single handle will adjust both the water’s temperature and volume, so you can adjust it easily. 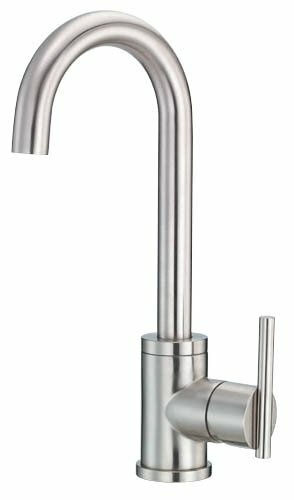 If you’re looking for a faucet that has a classic design but comes with all the features you would expect from a modern faucet, then Danze’s D404557SS model is a perfect fit for what you’re looking for. This faucet has a four-hole mount style, and it comes with a pull-out side spray. The side spray is made out of brass, and it comes in a matching finish. The faucet uses ceramic disc valves to provide a leak-free operation, and the valves increase the faucet’s durability. 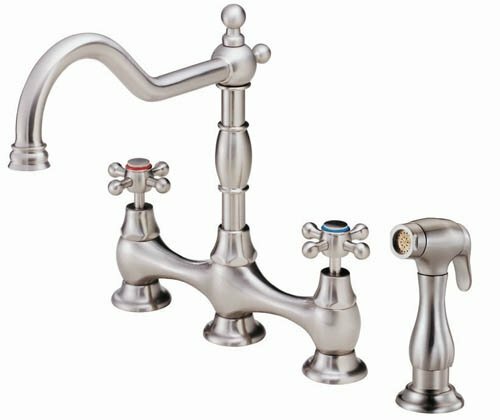 The faucet has a Victorian-style design that will look great in every kitchen with a traditional design. Looks Amazing – This faucet looks amazing. It is simply beautiful. The faucet will turn the heads of your guests, and it will attract a lot of compliments. Conclusion: The Danze D404557SS is a Victorian-style faucet that will look great in traditional kitchens. The faucet is suitable for a four-hole installation that can be problematic of beginner do-it-yourselfers. There is nothing more stylish than having a commercial-looking faucet in your kitchen, especially if you have an island counter. 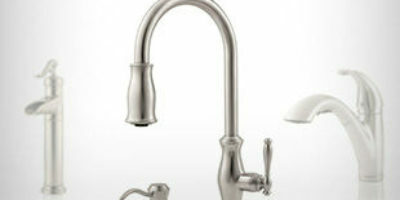 These faucets look great, and they become the centerpiece of your kitchen once you install them. The DH451188SS kitchen faucet produced by Danze has an open coil design that looks great in every available finish. The faucet comes with a pre-rinse sprayer that will reach every corner of your sink. The sprayer produces two types of water patterns, each of them better at different tasks. 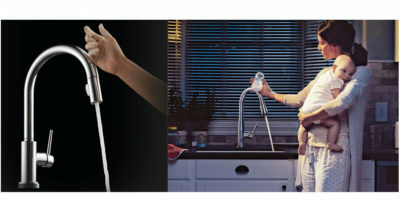 Minimalist Design – The faucet has a minimalist design that will enhance your kitchen’s decor. This design will be fashionable for a long time, so you will be able to use the faucet in the years to come. Twist To Change Patterns – Unlike other faucets that use a pre-rinse sprayer, this model doesn’t require you to press a button all the time when you want to use a different spray pattern. All you need to do is to twist the sprayer’s head. Installation Instructions Could Be Better – The faucet comes with installation instructions, but they can be confusing at times. Inexperienced people might have problems following them. Conclusion: The Danze D404557SS is a great faucet that will improve your kitchen’s looks. The faucet has a good pre-rinse sprayer that will be of great help in the kitchen. Should You Choose Danze For Your Kitchen? Danze is now a highly recognizable faucet manufacturer, but some people might still be wondering if buying one of their products is a good choice, especially since their products are not cheap. In the following section, we took a closer look at the kitchen faucets produced by Danze, and we selected some of this manufacturer’s highlights. – Danze produces a lot of kitchen faucet models, and all of them look and work well. Whether you’re looking for a traditional-styled faucet or a modern one, you can be sure you’re going to find a Danze faucet specially tailored for your needs. – Danze faucets look spectacular. There are only a few faucets manufacturers that can compare their products with the ones produced by Danze, and we’re not certain the other manufacturers would get the upper hand, even though some of them are more expensive than this one. Every faucet is attractive, even if it has a simple design. Danze faucets look great, and they will improve your kitchen’s design. – Danze is renowned for the durability of their products. 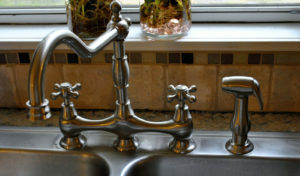 They use metal, especially brass when they construct a faucet, and that increases the faucet’s durability. The fittings they use are flush, and they test their products before they release them on the market, so you won’t receive a faulty unit. – Most manufacturers develop one or two types of handles, and then they use them for every faucet model they develop. Danze doesn’t do that. For every type of faucet they use, the handle is an integrated element, and you most likely won’t find the same one in another model. This attention to detail makes their products better than others on the market. – Despite the fact that the faucets look as if they’ve been extracted from a movie set, they’re rather simple to install. Danze faucets come with installation instructions, and you can even find video tutorials online that will help if you somehow get stuck during the installation process. – Danze faucets come in a large variety of finishes, but all of them are well-made. The finishes are scratch-resistant, so they will pass unscathed through the regular wear and tear in the kitchen. – These faucets have a low maintenance. You don’t have to clean them too frequently, and when you do, you don’t have to use cleaning products. You can simply clean them with a wet cloth, and they will look as good as new. Even though these faucets look sophisticated, they are easy to install, and they are also easy to repair if something goes amiss. You can find spare parts for Danze faucets at some local retailers, but you can also find them on the manufacturer’s website. Due to the fact that every faucet comes with a lifetime warranty, you can contact the customer support service any time you encounter a problem. All the kitchen faucets produced by Danze comes with a limited lifetime warranty. The warranty ensures that the product you receive is free from defects in workmanship and material and that it will be so for as long as you use the faucet. If the faucet has any electronic parts, they are warranted to be free from defects in workmanship and material for a period of 5 years. The warranty does not cover the batteries the electronic parts might use. According to the warranty, Danze will replace any faulty part free of charge in the specified time period. If replacing the faulty part is not practical, the manufacturer might choose to replace the entire faucet or offer you a refund. You should avoid using powerful chemicals, steel wool, and abrasive cleaners on the faucet as they might dull the finish and void the warranty. The warranty will only be valid if you have a valid receipt. Danze’s customer service is very professional, and their specialists really know what they’re talking about. You can contact the customer support service 6 days a week, and you should do so whenever you encounter a problem. The customer support specialists will provide valuable information if you get stuck during the installation process, and they will help you find out the faulty element of a faucet if it comes to that. Danze faucets incorporate some of the latest technologies available. Here is a list of what you can encounter when using one of their products. – All the faucets produced by Danze use ceramic valves and cartridges. This increases the faucet’s durability, and it provides years of leak-free use. – Some models use pull-down sprayers that have a long reach. The sprayer has the same finish as the faucet, and it is very handy in the kitchen. – Some models use pull-out sprayers. Unlike the ones that have a pull-down sprayer, these ones have a shorter reach, and the faucets are smaller. – Some faucets have articulated designs. These designs allow the faucets to occupy a small space when they’re folded, but to reach every corner of your sink when they extend. This feature is very good for people with crowded kitchens. 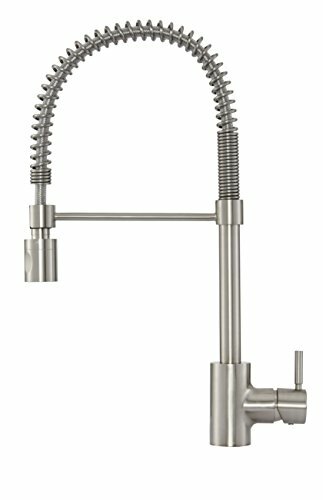 Danze produces a wide range of kitchen faucets, so you will surely find a model that will fit perfectly in your kitchen, whether you’re looking for a traditional-styled or a modern unit. Their products are renowned for their durability, and that’s to be expected since most of them are more expensive than the ones produced by the competition. However, even though Danze faucets are more expensive, they also provide a great user experience. They are easy to install, so you can install them without spending money on professional help. They come with a limited lifetime warranty, so you will receive free spare parts if anything goes amiss, and they have superior finishes that are scratch-resistant. We believe that after reading our short selection of Danze faucet reviews, you will be able to make an informed decision whether or not their products are a good fit for your kitchen.